My very first Ipsy bag! 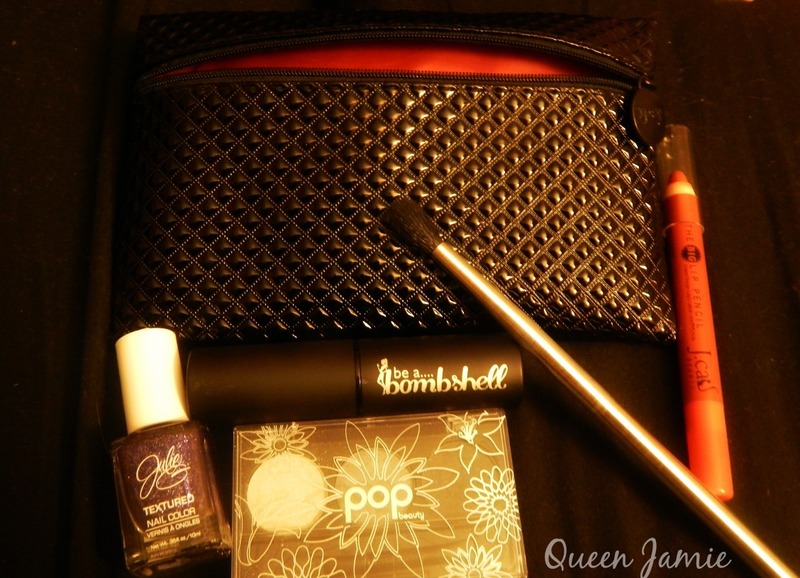 I recently joined the Ipsy monthly subscription bag. I have always worn makeup but I never really used much of it. I would love to have a bigger collection of products and I thought this would be a good way to do it! I decided against doing a video for this bag because I couldn’t help opening it up as soon as I got it and trying everything on! I actually wasn’t a HUGE fan of everything in the box but I did enjoy a few of the products and the bag itself, which you can see in the photo is really cute. I’m just going to list the products and tell you what I thought of each one. 1. Mirabella – Eye Blender Brush: “The Mirabella Eye Blender Brush fuses eyeshadow to create a naturally sculpted eye. Tapered domed shape provides flawless and easy application. Hand-sculpted brush is made with the finest quality materials and features exclusive brushed aluminum ferrule and handle.” -Ipsy I am very happy that I got this brush, I was in need of a blending brush, I’m still working on my brush collection! I have used it and it works well. 2. Be a Bombshell – The One Stick: “An all-in-one multiple stick with a smooth texture. Apply to eyelids, cheeks or lips for the perfect pop of color anywhere!” -Ipsy When I first saw this in the bag I was REALLY excited. I love the packaging, I love the name, and the color was really cute (I got “Girl Crush”). However I’m not really sure I’m a fan. I can see using this as a blush, it only takes a little. I tried using it on my lips and it just did not glide well and looked odd on me. So I wasn’t really so happy with it but I’m going to play around with it and see what I can do! 3. J.Cat Beauty – Big Lip Pencil: “The Big Lip Pencil is a hydrating and vibrant lipstick as well as a sculpting lip liner. It’s destined to be in your makeup collection!” -Ipsy I got the color “Red Rose” which is bold for me! I toned it down a little bit and wore it during the holidays. I’m pretty sure that is the only time of year I can get away with wearing it though! 4.POP Beauty – Bright Up Your Life Eye Shadow Trio: “This palette of hues adds definition & intensity to lids, creating a broad range of looks that complements all eye colours. From brightening bare to sultry smoke, these hues blend smoothly onto the lid, adding a veil of silky luster that will outlive the day or night!” -Ipsy I kind of wish that I had gotten the neutral browns instead because I already have smokey palettes like this one but I do like it and have used it. So far so good! 5.Jesse’s Girl – JulieG Holiday Frosted Gum Drops: “This holiday season, this sparkling purple textured treat will have visions of sugar plums dancing in your head – and on your nails!” -Ipsy I love this polish! I got the color: Sugar Plum Fairy. I only did one coat and the polish chipped after a day or so. I think if you used more coats it may last longer. You are advised to not use a base or top coat if you want that gum drop texture. I thought it was really cute and fun for the holiday season. I really wish it had been in an emerald green or dark red so that it was more festive for Christmas but it was still very cute. If you are interested in learning more about Ipsy head over to their website!